On Sunday the 13th of January, Holy Land Day was held in our parish. Representatives of the Franciscan Minors were present in the parish during the Masses to do the collection in favour of the Holy Land. During the Masses celebrated in the weekend of the 26th and the 27th of January, petitions were collected including the signatures of various people who participated in the Masses with the aim of liberating Asia Bibi, a Pakistani citizen who was condemned to death because of her profession of the Christian faith. The parents of those children who attend the Catechism lessons popularly known as ‘Id-Duttrina’ had a meeting held for them on Monday the 28th of January at 5.00 p. m. at the MUSEUM premises. The meeting was delivered by Anton Mercieca SDC. The Archpriest did the introduction. The parish priests of the diocese of Gozo took part in a seminar that was organized by them on Monday and Tuesday the 28th and the 29th of January 2013. The seminar was held at Mount St Joseph Jesuit Retreat House. The Bishop of Gozo Mgr. Mario Grech was present. 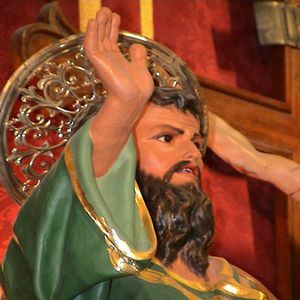 The Church of Marsalforn celebrated its titular feast of the Conversion of St Paul Apostle as usual. Our parish was invited to participate in the festivities in honour of the Apostle of the Gentiles. On Friday the 1st of the month, the Parish Priest Can. Reuben Micallef led a Concelebration on the occasion of the third day of the Triduum. The Mass was animated by the Regina Angelorum Choir. The Mass was at 6.00 p.m.
On Wednesday the 6th of February various representatives of groups in the parish met together with Archpriest Fr. Reuben Micallef to discuss the titular feast that is celebrated in August. The meeting was held at the Parish Centre. It began at 6. 45 p. m.